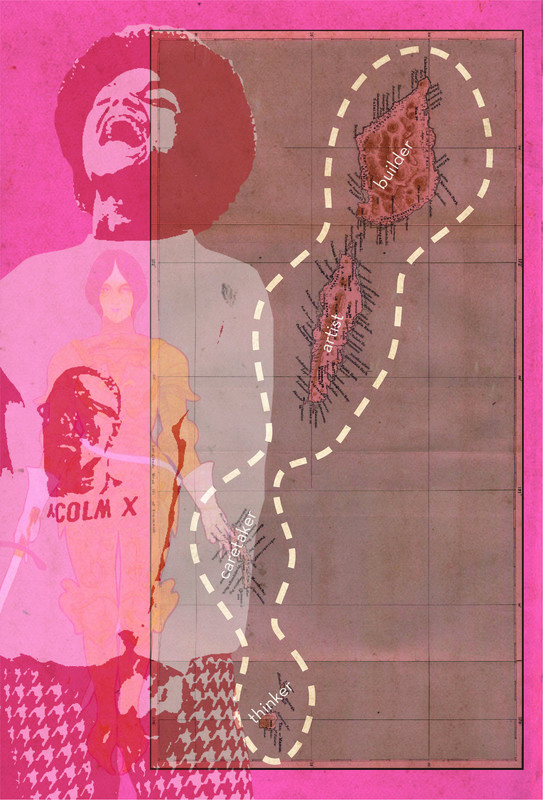 Image caption: a collage with a pink background depicts a person wearing a Malcolm X shirt. Meanwhile, the graphic reads ‘builder’, ‘artist’, ‘caretaker’, and ‘thinker’. “Base-building” is the idea that cohering a working class constituency supportive of socialism is the central task of our present political moment. However, the working class is cut across various lines of difference, and the correct management of those differences is crucial to building a broad, democratic, and truly liberatory working class movement. In mainstream politics, this contradiction is resolved through the use of “interest group politics.” Through “interest group politics,” demographic categories imposed onto society from above harden into de facto segregation, and communities are transformed into pressure groups. The key figure in this framework is the “power broker”: a leader often selected due to their privileged relationship with more powerful outside forces, be they financial or political. While the power broker is sometimes raised up by the community through a legitimate and democratic process, more often, the broker is imposed by outside forces or self-selected. Through the figure of the “broker,” interfacing with people from different backgrounds becomes someone else’s job. The “broker” caucuses with other “community leaders” without the involvement of the community, allowing everybody to stay safely in their little bubble. We never have to attempt to organize a multinational and even international politics of class unity — a politics capable of uniting working people across race, ethnicity, nationality, gender, sexuality, etc. Relying on a politics of brokerage is convenient for us, since it allows us to avoid having to do the painstaking work of organizing, an endeavor which continually exposes our flaws and limitations and throws in our faces ugly truths about living, breathing human beings. The idea of “leadership across differences” arises from the need or desire to construct a multinational, heterogeneous working class movement, the act of which runs diametrically counter to very powerful objective tendencies in our society which impel us toward segregation and atomization. Electing people to office doesn’t automatically establish leadership across difference. In fact, it is easily incorporated into a brokerage model, precisely because the various social bases are only coming together around the election, rather than maintaining constant contact that goes beyond a particular political campaign. If anything, given the broad base of support necessary to win an outright majority of voters under current conditions, it impels radicals toward reproducing interest group politics in the service of a political campaign. Until socialism itself becomes a political identity binding together an archipelago of organic working class constituencies, we remain trapped within the parameters of interest group politics. Socialists cannot merely rely on soliciting support from existing “community leaders,” as has been the model of activism in recent decades. “Leadership across differences” is the antithesis of brokerage politics, because it forces us to get out of our comfort zones and put the work in to building political relationships based upon mutual trust and respect. It confronts us with the necessity of raising up new leaders rather than relying on existing institutions and power structures. This process of working class leadership development is identical with base-building, and in fact constitutes its core imperative.